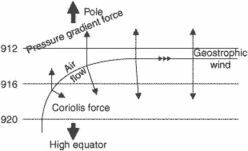 That horizontal wind velocity for which the Coriolis acceleration exactly balances the horizontal pressure force. a horizontal, even, and straight movement of air with no force of friction and with balance in the gradient of pressure and the deflecting force of the earth’s rotation; the simplest theoretical scheme of air movement of the rotating earth. The actual wind in atmospheric layers higher than 1 km above the earth’s surface is close to the geostrophic wind. The geostrophic wind is directed along the isobar, with an area of low pressure remaining to the left of the stream in the northern hemisphere and to the right in the southern. The velocity of the geostrophic wind is proportional to the magnitude of the horizontal gradient of pressure. With equal gradients it is inversely proportional to the density of the air and the sine of geographic latitude and therefore increases with elevation and with increasing nearness to the equator. Pressure-gradient force causes air parcel to accelerate. Coriolis begins deflecting air to the right. Coriolis increases as speed increases. Coriolis eventually balances pressure gradient forces. That horizontal wind velocity for which the Coriolis acceleration exactly balances the horizontal pressure or gradient force. However in polar and extratropical latitudes where the geostrophic adjustment time scale is on the order of several hours and substantially less than the diurnal cycle and, even more significantly, much less than the life time of the coupled poleward and equatorward meridional mass transport within cyclonic/anticyclonic circulations of several days to a week, geostrophy with cyclonic curvature and gradient balance prevails as the primary mode for the mass circulation as well as the transport of atmospheric properties. Ochoa J, Sheinbaum J, Badan A, Candela J, WSilson D (2001) Geostrophy via potential vorticity inversion in the Yucatan Channel. HC13 found, for instance, that geostrophy corresponds to gyroscope precession and that inertial oscillations correspond to gyroscope nutation.